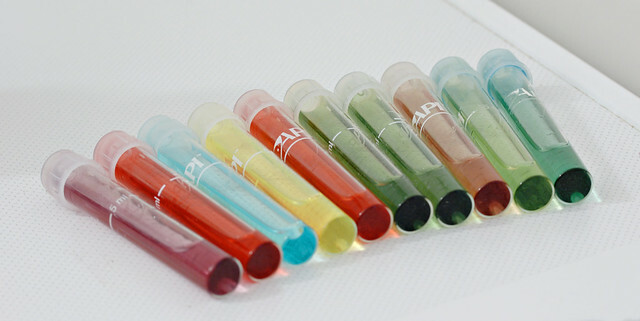 Since writing about test kits, I have been paying a bit more attention to where people go wrong and I have slightly revised my recommendations on the importance of various kits for beginners. Ammonia and nitrite are still top of the list because ammonia is harmful to fish and nitrite causes haemoglobin to convert to methaemoglobin, which effectively suffocates fish as they are no longer able to absorb oxygen. GH and KH are general hardness and carbonate hardness respectively. Both types of hardness are measured in (German) degrees, where 1° is 17.848 ppm. 1 ppm of hardness is equivalent to 1 mg/l (and also one American degree, but this should not be used as ppm or mg/l are simple enough and considerably more common). Water hardness comes second because fast changes in water hardness are quite likely to harm or kill fish and this is something that many people are not aware of. One can avoid these changes by always drip acclimatising, especially if one is not able to measure them. While nitrate in itself is unlikely to be lethal to fish in the concentrations that are most often seen in aquaria (up to 500 ppm), there is scientific research to back up the popular consensus that it is best to keep nitrate as close to 0 ppm as possible because it will harm the fish (for example, it will result in stunted growth). 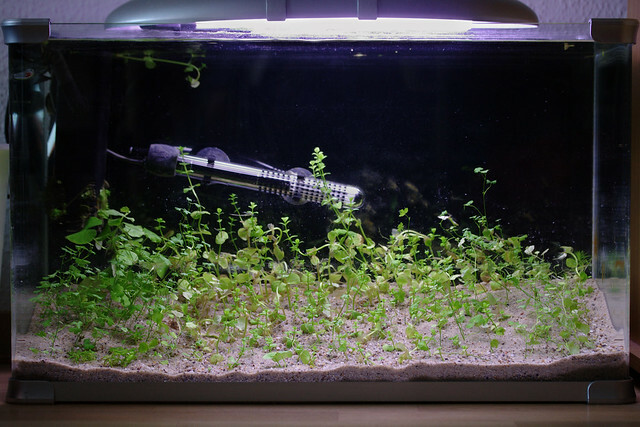 Nitrates will rarely rise above 50 ppm in a well maintained aquarium even if they are not monitored as they will normally be used up by plants and removed through water changes. pH is important, but not as much as as water hardness because a difference in water hardness will indicate that there is a difference in pH, but the KH also indicates how stable the pH is. Most “master” test kits do not include the water hardness kits, so it is best to double check what you are getting if you buy a set. I am still working through the kits that I used for the 60 litre aquarium, even though I have been using them for all of my aquaria, so they really are not all that expensive at around £30 for the set and well worth the money to save beginners a lot of headaches. When raising young fish, it is a relatively good idea to occasionally do large water changes to remove waste products from the aquarium, but this is not the commonly given reason for the large water changes; the more common belief is that fish release growth stunting hormones/pheromones, but I have been unable to find any scientific proof to back it up. It is true that fish release a growth hormone (GH) which stimulates growth, but they can also become resistant to the hormone if they are already stunted, for example, because the competition for food is too high. There are also other factors that affect growth, including higher nitrate concentrations. Of course, any ammonia and nitrite are very high on the list, but this should not be a worry as neither should be present in an aquarium. Before starting on the water change, I check the water parameters. I know that my tap water is quite hard, and the results below show lower water hardness, lower pH and higher nitrates. This means that my tank water hardness has drifted downwards from my tap water and not all nitrates are being used up, which indicates that I need to refill the tank very slowly after the water change so that the fish have time to adjust to the change in water parameters and do not go into osmotic shock. 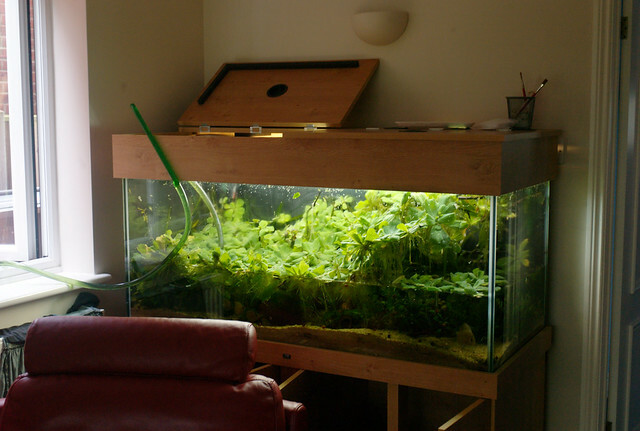 As can be seen in the photo, the tank is really rather overgrown with Pistia stratiotes (water lettuce), so I regularly have a bag or so of water lettuce to sell. If you would like some, reply to the post or contact me for more information! The temperature has been steady at 20 °C, which is perfect for these fish and fits in with the recommendation of the breeder from whom I bought them. Following these tests, I performed an 8 litre water change (with the old water going into the quarantine aquarium that contains the loaches) and finished off by wiping the glass on the outside. Current maintenance schedule consists of cleaning the glass and pruning the plants once per week. While normally I would recommend weekly water changes to beginners, in a well balanced aquarium such as this (which is lightly stocked and is planted enough that individual plants can not be counted) which does not contain young fish and where the fish are not overfed, the water changes are not as important because the plants can maintain the water quality. For the moment, I do water changes when I feel that they are needed or need water for the unplanted quarantine aquarium. For the last week, I have been dosing 2 ppm which is being processed into nitrate within 24 hours. So now, I am only waiting to collect the new fish, as the bacterial colony is stable. Because the Danio margaritatus will be so small, I am not going to move the Pseudosphromenus dayi to the new aquarium until the danios are large enough to not be eaten. I have also been unable to find any of the loaches I was interested in. The plants are growing well; I currently have the light on a 5 hours on, 4 hours off, 5 hours on, off for the night regime: it seems to be working well. There are no problems with Cardamine lyrata and Hydrocotyle cf. tripartita. I have also added one pot worth of Pogostemon helferi, in preparation for the fish… I expect to be buying the remaining plants soon. On the other hand, the Lindernia rotundifolia has completely melted, worse than any Cryptocoryne melt I have ever seen. I suspect this is because the stems I received were grown emersed (above water, the word comes from the Latin word ēmersum, from which “emerge” is derived) and the leaves could not survive when submerged under water. Every single one of the original stems has now rotted, but every node has grown new axillary buds, which have developed into individual plants. For the vast majority, each plant is now 20-30 mm tall and growing well. Given that the D. margaritatus are now ready for collection, so I will be looking to collect the remaining promised plants this week, or early next week, and to buy the rest as soon as possible. Water evaporation is still high, as I am not using the condensation tray yet, so I have had to top up the water a few times already. I used dechlorinated tap water, which raises the KH, but this is not an issue as there are currently no fish in the aquarium. I *think* something might be happening with the nitrite… but I can’t really be sure, given how little the readings are changing. I also think I might have overestimated what the nitrate is, previously, although the recent water changes should have reduced it by quite a lot.